Christian Hageseth is the face of the revolution--an entrepreneur and father of three who worked in the white-collar professional world for 20 years before opening his first dispensary. The founder and chairman of Green Man Cannabis, the fastest-growing marijuana company in the country, he's the perfect tour guide through the wild frontier, where police hardly know what laws to enforce, or parents what to tell their kids. 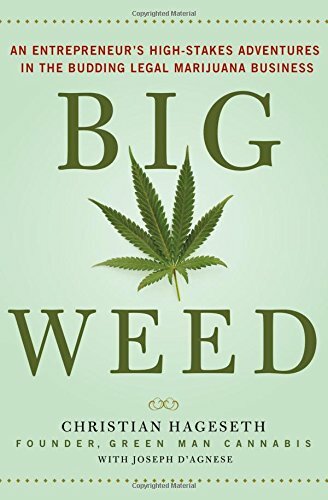 He paints a colorful picture not only of how he got into the business, but of the big interests that are eager to do the same--namely Big Tobacco, Big Agra, and Big Pharma. He predicts a future where the marijuana market splits in two: the high-end, artisanal market, supplied by individual growers and small farms, and the mass market, covered by the cigarette giants and anyone bold enough to compete with them. Much like beer and coffee, your brand of weed will be just one more reflection of your lifestyle. It's an entrepreneur's dream, and Hageseth invites us along as he pitches skeptical investors, negotiates a shaggy cast of colleagues, and builds the biggest business he can.